THE GANGWISH LIBRARY HAS A NEW LIBRARY HOMEPAGE. HR Source has been added to Ebscohost as a trial. You will find it at the very top of the page when you open the databases. Click on it and try it out and let us know what you think about this resource. Do you give it rave reviews or not? Students please note that we have a web browser security problem. To get to the Discovery search with some browsers there is a little work that you have to do. For some browsers, if you click on the Discovery link you will get the message: "Your connection is not secure". Please go to the "advanced' button and add it. Then go to "add exception" and click it. Then click the "Confirm Security" button you will see the Discovery search box. Please note that you have to be logged in to the OU Portal to be able to use the Discovery tool. Students may place an interlibrary loan request online for books and media by using the following databases. 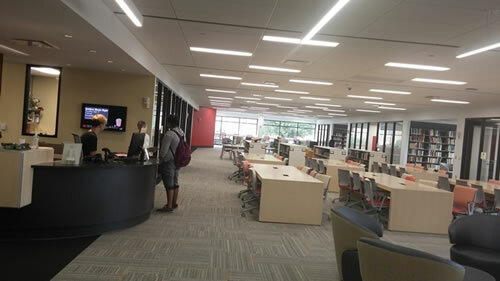 Books and media can only be requested for students who can come to Gangwish Library and pick them up. See our "Circulation Policies" for additional details. Students at all sites and online may make requests for copies of journal articles. If you have questions about interlibrary loan or to request a photocopy of an article, submit your request in the box below. Complete bibliographic information is required for article requests. Include your name, OU ID #, phone number, and OU email address. USE THIS FORM TO REQUEST MATERIALS FROM OTHER LIBRARIES ONLY. DO NOT USE THIS FORM FOR HELP IN USING RESOURCES.